Penniless and out of options, Roxanna is forced to remain at the fort. As she spends more and more time with the fiery Colonel McLinn, the fort is abuzz with intrigue and innuendo. Can Roxanna truly know who the colonel is—and what he's done? The Colonel's Lady is another beautifully written story by Laura Frantz. We are taken back into the frontier of Kentucke once more, following Roxanna Rowan. Roxie was desperate to get away from Virginia. Her mother had just died and the man who had been courting her broke their engagement. Wanting a normalcy to come back to life, she decides to pack up everything she owns and heads out on a river boat to go see her father who is a Captain serving in the army at a military post. Roxie wanting to surprise her father, never sends word of her travels, and hopes to meet up with him, before his enlistment is over with. Upon her arrival, she finds he is still in the field and due back any day. Colonel Cassius McLinn is in charge of the frontier regiment during the Revolutionary War. He was sent to Kentucke by orders of Gen. George Washington. McLinn had previously served under Washington's personal guard. Out on mission with his men, looking for redcoats or the Indians working with the redcoats, McLinn and his men hear troops advancing and preparing for the worst fire, only to find it is a section of their own men. Colonel McLinn is devastated to find out, that he hadn't fired on the British, but Captain Rowan and the men under his command. Knowing his fate, Captain Rowan asks that Colonel McLinn look after his daughter Roxie. The story follows Roxie and McLinn through their relationship, which at first is mostly work. McLinn hires Roxie on in his office as a scribe of sorts, her father taught her the short hand he wrote in for his job when she was younger. She takes the job since she is unable to leave until spring. Their feelings go back and forth, never really getting in-sync, plus, McLinn has yet to tell Roxie he fired the shot that killed her father. 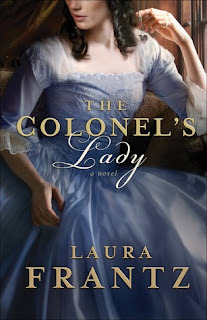 The Colonel's Lady isn't as adventurous as the other books I've read by Laura Frantz, but it was an interesting read. There was a twist that I didn't see coming. I never once questioned that person at all and to have it reveled, surprised me. The ending left me wanting just a little bit, the conclusion to the build up seemed a little to quick and clean, but in the end, the story was enjoyable. Oh yes, me too! Where 'that person''s loyalty truly lay was a surprise, in the end. Now I remember. :) There were some small hints though when I looked back. I read The Colonel's Lady last year and gave it 4 stars too. And I totally understand and agree with what you've written on it. This book is the only one by Laura Frantz I've read. I'm interested in Courting Little Morrow and Love's Reckoning. Here. Let me check out your review for Love's Reckoning. Thanks for sharing, Kate! Ganise, I haven't had time to look back. I need to now, to see the signs. It was an interesting twist. I really enjoyed Courting Morrow Little. That one and Love's Reckoning are my favorites so far by Laura Frantz.